The Global Fool’s mission is to raise awareness of environmental problems and their global nature. Please note: The Global Fool is totally and proudly independent. Why the Fool? 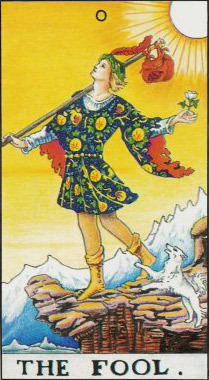 In mystical symbolism, the Fool is the spirit in search of global experience and knowledge and is associated with zero, the conscious state of being not influenced by the ego. He/she represents the initial stage of development in the journey of discovery through life, a journey that ends with the World to then repeat itself. Kofi Annan said something like “Arguing against globalization is like arguing against the law of gravity“. We won’t argue, we’ll follow the Fool’s journey. What’s going on here? I’ve been waiting for a few months now. No new posts. Miss reading the science of the environment on this blog. Come back! Sure I do appreciate a blog free of ads. I do appreciate The Global Fool’s bloggers even more as it is clear they write because of personal dedication. I come here often looking for food for thought on the environment and other interesting topics. Speaking for myself, a little more coverage of pollutants in food and drinking water would be welcome. I find the previous posts on arsenic contamination of rice, chickens and drinking water very compelling. What about other contaminants of this type? Fascinating blog. Hope you can post more often. Love this blog. Factual, efficient, outstanding selection of current issues. I’ll be back often. This is a fantastic blog! I wish I had come across it earlier. The pressing issues covered in the posts are highly informative, thought-provoking, and empowering. Thank you, Neha! I enjoy reading your blog….. great topics and superb writing. Neha’s blog is Life Science Exploration. I’m happy I found this blog. It brings up issues I’m very interested in and it has a nice balance of different topics. I hope to see more posts about pregnancy and sustainability.